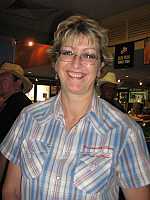 The Tamworth County Music Festival is held every January in Tamworth, NSW Australia, and is one of the largest musical events on the Australian calendar. 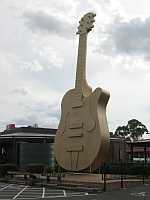 Tamworth is known as the capital of Australian Country Music, with this large golden guitar on the edge of town to remind visitors of this. The festival is a feast of music, formal, informal and otherwise. 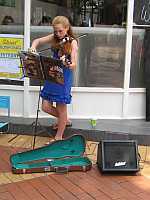 Many buskers are on Peel St in the centre of town. This is the hub of the festival, and the combined noise from the buskers is intense. 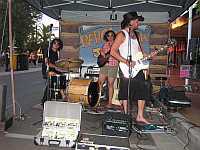 As always, some buskers are louder than other, like the band here, Marshall Pro. Fortunately they were excellent, lead by a fine slide guitar player. Tamworth is pretty hot during the festival, so air conditioned bars are inviting. 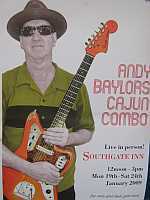 A favorite stop for me is the Southgate Inn, where Andy Baylor’s Cajun Combo are regular favorites. Andy Baylor and his outfit come (mostly) from Melbourne Australia. People like to dance at Andy Baylor’s shows. His expert panel (the guitar player and keyboard player) judge the best dancers, who get CDs. 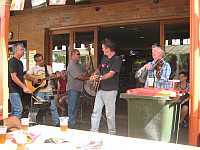 Tamworth overflows with music during the festival. The commercial side of the music business is everywhere, and draws large crowds. However some prefer the less commercial shows. Wendy, shown here, provides a valuable service. Every year she prints a calendar of “Wendy’s Choice Picks” indicating the best gigs each day. It folds ingeniously to fit into a back pocket, while still showing her program for each day at a glance. Wendy hands these out to anyone asking, they have become a Tamworth institution. The faces at Wendy’s shows always seen familiar… Download Wendy’s calendar here to seen where you should have been during Tamworth 2009. I played at the Andrew Clermont Supper Club, a haven for acoustic music lovers at Tamworth. 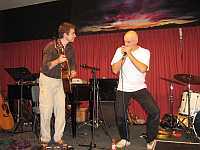 Andrew Clermont is a major feature of the Australian acoustic music landscape. The picture opposite shows me on stage with the mighty Josh Bennett. The video below is Andrew Clermont and me on the same night.